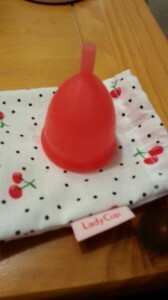 I've been eagerly awaiting the arrival of my second LadyCup, which finally arrived today. It's part of my goldilocks trio, and I wanted a spare to keep at work for emergencies. I settled on the "wild cherry" color because of how rich and deep the red looked on the website. In case anyone else is considering it, please be aware it looks completely different in person, I'm sorry to say. It's almost identical to the color of the red Fleurcup, which is decidedly hot-pinkish rather than red, to me. The "summer plum" is lovely and very true to color, but I guess that's not the case with all cups. I just wanted to share in case anyone else was on the fence as I was (now I wish I'd gone with the honeysuckle!). I hope this works - I've never tried to do a cut before.